Over the years I’ve been writing this blog, I’ve also been getting dozens of people asking me about things to do with celebrating. Mainly, I’ll grant you, people with weddings to organise – they usually need somewhere that’s quirky and original and that won’t break the bank – just like everyone else, but occasionally I get the odd ‘money-no-object-I-just-want-it-to-be-fabulous’ question. Then there are the people who want to arrange a birthday party or a quiet dinner. Now I’m no expert in this field – believe me, wedding planning pays better than haunting, but I do keep an eye out – and occasionally I even put my phantasmagorical thinking cap on. For restaurants and pubs, may I suggest you peruse my “Eating Out” and “Drinking” sections. But for now, here are going to be a few thoughts I’ve had on wedding/party/celebration venues and services. Don’t worry. This is not going to be paid-for advertising (save the little Adsense ads which I have no choice-control over.) And most (read “pretty much all”) of it I won’t have tried myself. It’s an unscientific, brainstormed section – funky ideas I’ve had, thoughts and suggestions for local (Greenwich or nearish) places and things that I think might be good. Like a sort of interactive FAQ. So here are a few thoughts I’ve had – I’ll try to give you links where I can, but virtually none of this is properly researched – I’m a blogger, not a wedding-planner. It’s a few ideas to set you in the right direction. Whatever else, you need to get it all done officially. You need to give notice of your intentions and sort out a proper way to go about it formally. 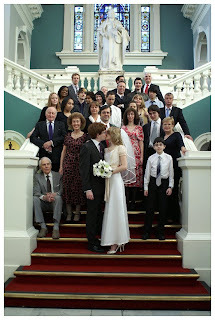 I could just do a cut-and-paste job of Greenwich Council’s dedicated registry page but it seems like reinventing the wheel – find a list of places that are licensed for civil partnerships and weddings here. St Alfeges – a fabulous Hawksmoor building right in the centre of town. You need to live within the parish boundaries or at least be a regular worshipper there, but sometimes things can be worked out. They usually like you to talk to them on a Saturday morning but check out the website by clicking the name above. Our Lady Star of the Sea (RC) A glorious 1851 Pugin affair up Crooms Hill. No website but the phone number’s 020 8858 0662. All Saints, Blackheath has similar requirements to St Alfeges. Right at the scary top, we’re looking at the big venues. The Old Royal Naval College must be one of the most sought-after venues in Greenwich, and there’s no denying that the Painted Hall is pretty grand. Sadly for many, so is the cost, though if you have huge numbers to cater for and a big budget, this could be your blow-out of choice. The Queen Mary Antechamber isn’t much smaller, and nor is the cost. The King William Restaurant is smaller in size and has attractive arched ceilings. It’s immediately below the Painted Hall, and although it’s effectively underground its white-painted walls and high windows make it light and airy. The Admiral’s House is smallest of all – an intimate room with a large wooden table and grand paintings. The ORNC is licenced for civil weddings, but it does seem to come with one caveat as far as I can see. They insist, I am led to believe, that the catering is done by their in-house caters, Leiths. (I am sure they’ll put me right if I’m wrong…) I have eaten at the King William restaurant and have found the food to be serviceable but not exciting. My next biggie is Ranger’s House on the very edge of Greenwich Park and Blackheath. An extraordinary building, I’ve seen it all dolled up for an event and it was something else. Administered by English Heritage, don’t expect much change out of four grand – though just a ceremony and a few drinks is half price as long as you don’t take too long. Still on the terrifying side, The Trafalgar Tavern has been a wedding venue for a couple of centuries now – it was even used by Dickens characters in Our Mutual Friend. And it is beautiful. The ballroom upstairs is exhilarating and the view over the Thames from the bowed balconies is fabulous. 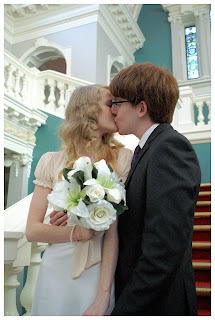 A great venue for a Regency-Themed wedding. Sadly the little bar that was done out like a ship has now been obliterated with a ‘makeover.’ There’s a downstairs “Trafalgar Club” but I’ve never seen it. Again, you’re not talking cheap. They’re not owning up to how much – you have to call to find out, which I always find suspicious. The swanky venues don’t stop there, though. The Queen’s House is yet another breathtaking venue – and a film star in its own right. Look to be spending in the region of £1,100-7,000 – I couldn’t tell whether this includes the slightly alarming-looking “personal co-coordinator”. It looks amazing, but I wonder whether with their “approved list of suppliers” and other rules and regs it might be a rather stifling experience. One thing’s for certain though – it would be an event not to be forgotten. I’ve been unable to find out whether the glorious Octagon Room at the Old Royal Observatory is available. I suspect not, because of the problems with keeping the park open after hours. It involves tiny trains and guests being counted – such a hassle. Moving on, Devonport House is another central Greenwich venue. I confess I know practically nothing about it. And after visiting the website, I don’t know much more. It doesn’t give you any idea of anything – it all looks a bit – well, corporate to me. They too, threaten the dreaded “coordinator” and force you to fill in an enquiry form, reminding you which bits are “mandatory” – am I the only person who just wants to scrap an online form that’s so rude? Just out of the area, smaller, but perfectly-formed, Danson House is an exquisite Palladian dolls house of a venue. Gorgeous, taking up to 60 guests and, I believe, licensed for civil ceremonies, it’s administered by the Bexley Heritage Trust. As is the glorious medieval Hall Place in Bexleyheath, which is also licensed for civil ceremonies, but is v. popular so might be rather full. 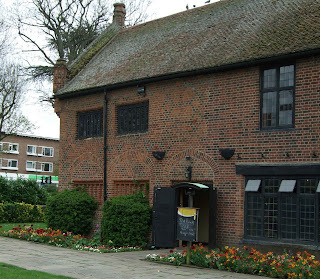 My final pick of the truly frightening, but a much smaller choice – more like having a reception in a jewel box than a palace, is The Fan Museum at the bottom of Crooms Hill. You can either have a tiny reception in the exquisite orangery – or spill over into a marquee, which for my money sounds a bit less exciting – after all it’s the whole dinkiness of their fabulous garden you’re after and let’s face it – a tent is a tent. They’re not owning up to any prices either. Practically every pub will give you a price for hiring it out for a wedding – some are worth it, others aren’t. This isn’t going to be exhaustive; just a few places I like that could be a starting point for you. Their website takes ages to load and is dogged with music and no way of turning it off, but it’s stylish and tells you more or less what you need. The Plume of Feathers is one of my favourites. Again, not quite in the centre, it’s a pretty place and the food’s good. They’re not admitting to holding events on their website but I went in there for a meal the other day and it was very clearly set up for a buffet. The Trafalgar Tavern is the only Greenwich pub I know of that’s also licensed to hold civil ceremonies (at least I think it’s licensed! )It’s massive, gorgeous, grand and glorious – and it knows it. You will need deep pockets and long arms to hire this place – but the photos will look great. Check the website for more. The Cutty Sark is definitely a little on the scruffy side, but it’s friendly, old and has a view to die for. I cannot find whether they do event hire and I can’t find a website either. 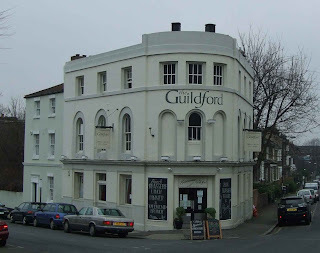 The Guildford Does lovely, lovely food, and has a proper beer garden – with plants and trees and lights. They can supply a marquee if necessary. Like all the others, no prices advertised on the website. I’ve never seen the upstairs function room at The Spanish Galleon but it may well be worth a peek when you’re searching out a venue. It’s bang in the middle of Greenwich and very close to the DLR. Check out the frankly unexciting website for contact details. More will be added if I think of them, but I won’t put every single pub that has a function room down. The Novotel next door to Greenwich Station isn’t the most exciting of venues, but I suspect that their events are solid and serviceable. They don’t mention weddings specifically, but the do have meeting and ‘banqueting’ rooms. For larger numbers, especially for cosy winter weddings, I am particularly taken with the extensive cellar at Davy’s Wine Vaults. See my feature about it here. Mycenae House in Westcombe Park isn’t at its best just now with next-door Woodlands under scaffolding, but their rates are not bad at all – between £350 and £600 for a whole day’s hire. I personally find The Clarendon Hotel a little tired around the edges but it is a hugely popular wedding venue on the edge of Blackheath, with several large rooms, a licence for ceremonies and a view of the heath that’s really rather good. Still in Blackheath, the Blackheath Halls have a couple of rooms – one enormous; the other much more intimate. GreenwichWest Community Centre on Greenwich High Road has a large (and from the pic – to my shame I’ve never been inside) grand-looking hall. No prices as per usual. I’ll be adding to this section as stuff occurs to me. Let me know if you come up with a fab idea! A glorious meander aboard the Silver Fleet is the top-end of the Thames Cruise market. I’ve been to a do on board the Silver Sturgeon and it was very swanky indeed. Or for a cheaper option, try chartering a Thames Clipper The fleet’s just been upgraded and the boats are really rather nice. Olivers Not a first choice, perhaps, for a wedding reception. But if you wanted a seedy, sensual, jazzy alternative party, you’d be hard pressed to find somewhere better. Olivier is notoriously difficult to pin down but if you’re after a fabulous authentic jazz-bar feel, this is your place. According to the council website, Firepower at the Woolwich Arsenal seems to be licensed to perform ceremonies, but I can find nothing about it on their website. However they do corporate event hire, so it’s worth an ask. True love knows no bounds – and just because you’re strapped for cash doesn’t mean that you want a rubbish wedding. So I’ve been trying to come up with ideas that cost as little as possible. There’s a few things you HAVE to pay for – you’re not going to get out of registry office fees etc – but you don’t have to pay out a fortune on swanky venues – you just have to be a bit lateral in your thinking. I have several friends who are pagans – and it was their choice to have a hand-fasting in the open air – but it also occurs to me that it was sincere, beautiful and sweet – and why should wiccans have all the fun? I’ve been to a couple now – one at the stone circle in Hilly Fields Park in Lewisham, another in a wood at the top of a neolithic fort in Hampshire – you may like to remember that Maryon Park and Gilberts Pit in Charlton have ancient connotations – or you might fancy Oxleas Wood – one of the most ancient woodlands in London? If that’s all a bit hippy for you, then don’t discount the upstairs rooms at pubs. Many charge, from silly prices to actually very reasonable. And some will even be glad to rent it out to you free of charge if you can guarantee a bar-taking (let’s face it – it’s a wedding – everyone will be buying drinks.) I’m not sure whether any in Greenwich will, but if you do a ring-round and still have no luck, then try the Square Mile – many pubs in the City have such poor takings at weekends, they’re only too delighted to let you have a room. Penderel’s Oak, The Citie of Yorke and The Centre Page are just three I or one of my pals have held parties in. Of these I like best the Citie of Yorke, though the Centre Page is close to the river, so you could arrive by river bus. The Phantom Webmaster reckons that the ‘price’ that Penderel’s Oak charges (or a disguised minimum-spend, perhaps) amounted to a minimum of 75 people so get your mates along. Some other friends of mine who had a zero budget for their wedding couldn’t afford a special car to take them from the registry office to the reception, so they found a white London taxi cab and just called him – it cost them the price of – well – of a cab, actually. Do take a glance through the wedding venues I’ve suggested – many of the rooms, especially the pubs, would work well for parties. The Spread Eagle Has two private dining rooms – seating 12 and 14 people respectively. They look sumptuous. I have no idea how much they charge – you’ll just have to call the mysterious Lesley to find out. Their website is here. One for a very special occasion and small numbers. How about hiring Greenwich Picture House for a birthday screening of your fave film? The screening room isn’t as lovely as it once was, but it’s still intimate and there’s a little private bar in there. I get the feeling you have to use their chosen caterers. I’m not a massive fan of Bar du Musee after having poor-to-no-service on my past couple of visits, but they do have lots of space if you want to invite lots of people for a sit-down, or if you prefer to hire your own space, downstairs takes 30 people and can be privately hired. Once again, talk to the mysterious Lesley. I’ll be adding to this every time I think of a good thing to do – do email me with suggestions! This frankly isn’t my area at all, but one or two places leap out at me. Firstly the Secret Garden Wildlife Centre is a great venue for children’s birthday parties in Greenwich Park – and, as such things go, not horrific in price. Several restaurants do children’s parties, or you might try a screening at the Picturehouse. Mycenae House in Westcombe Park isn’t at its best just now with next-door Woodlands under scaffolding, but their rates are not bad at all. The basement hall is painted bight kiddie colours. I will be doing more work on this section – in the meanwhile, do let me know of any fab kid’s celebration ideas, eh!